Let’s make it from scratch. 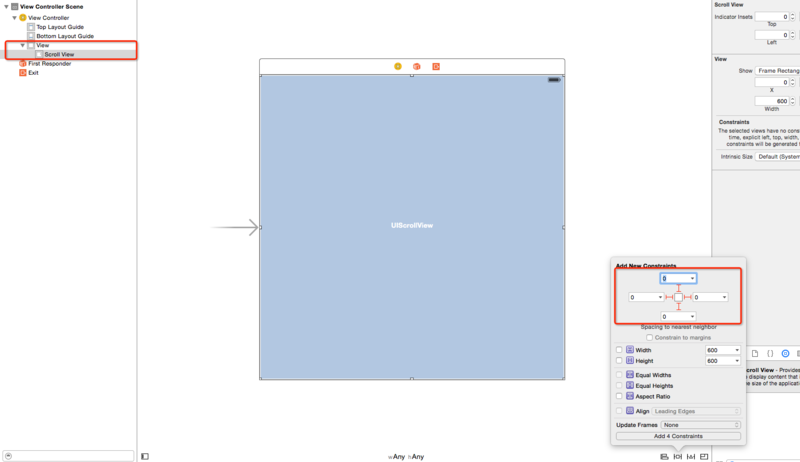 Choose a Single View Application template, name it anything as you like, in my case, UIScrollViewInStoryboard is used. Drag a Scroll View on top of View Controller's default View. As you see, Scroll View is the same size as View. Shouldn't Scroll View be bigger than View? In fact, the size of Scroll View and the size of its content are two different concepts. You can view Scroll View as a window, the scope you can see through it is often greater than itself. More on this later. Drag a View on top of Scroll View. I prefer to rename it contentView, the name just suggests its usage. Next step is to set constraints for contentView. But this time, it’s not that straightforward. Firstly, add four constraints as we do for Scroll View. What happened? Xcode gave us two warnings. 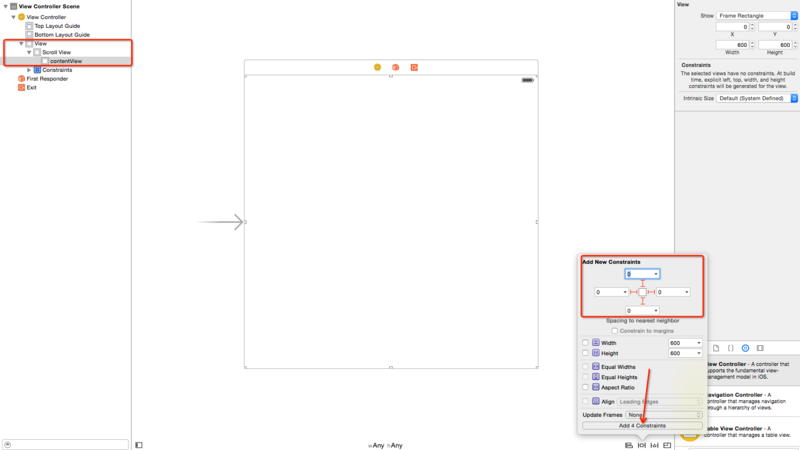 I think information lies in Document Outline gives better prompts than in Navigator, so let’s go there to have a look. 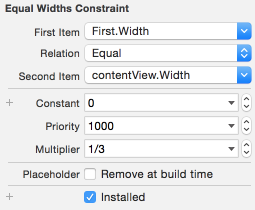 The four constraints we added for contentView just means contentView (the view we added manually) has the same size with Scroll View's contentSize (a property of UIScrollView defined in UIKit). 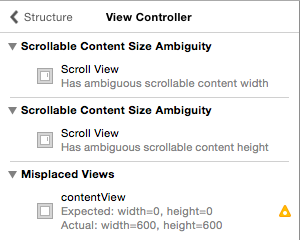 Actually we haven't specified Scroll View's contentSize yet, this is the reason why the first two warnings came out. The default size of contentSize is CGSizeZero, this explains the third warnings in Document Outline. In order to fix the problem, we should add more constraints to make the scrollable content width and height clear. 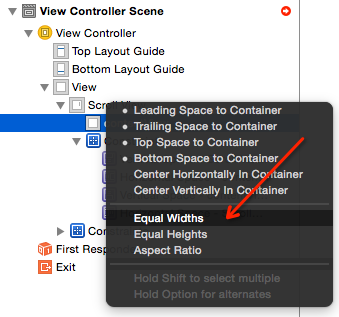 One way is to specify the contentView's width and height. Assume that I want to scroll horizontally and the content is three times of the screen. So the contentView should be equal height to screen and three times width of screen. 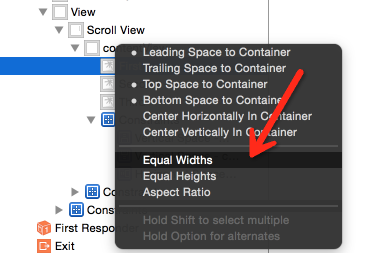 Ctrl-drag from contentView to Scroll View in Document Outline and choose Equal Heights. We will set contentView's width three times of the screen, but not now. Now let's decorate contentView with some images for final effect. 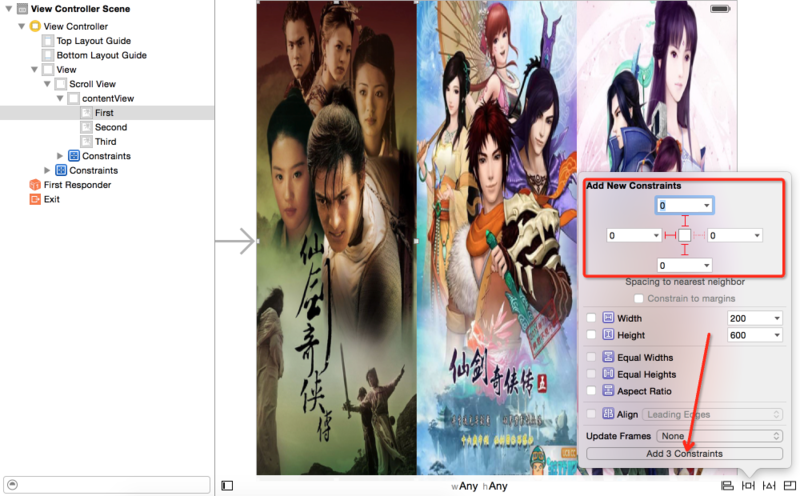 Drag three Image Views onto the contentView and set constraints for them in turn. Set constraints for them. 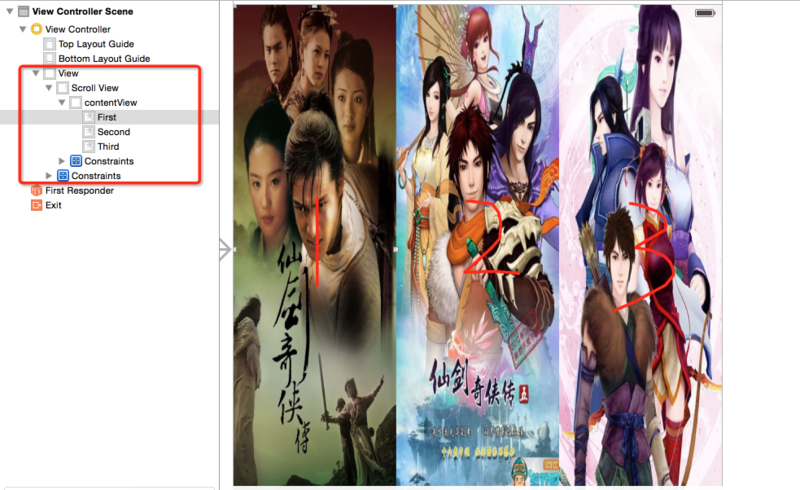 Take the leftmost Image View for example. 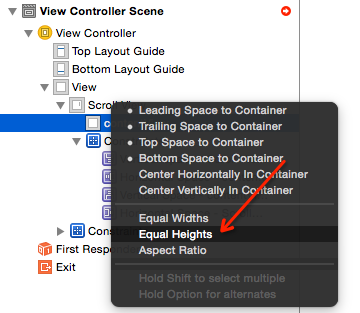 Then ctrl-drag from First (Image View) to contentView in Document Outline and choose Equal Widths. But this time, equal isn't what we really want. 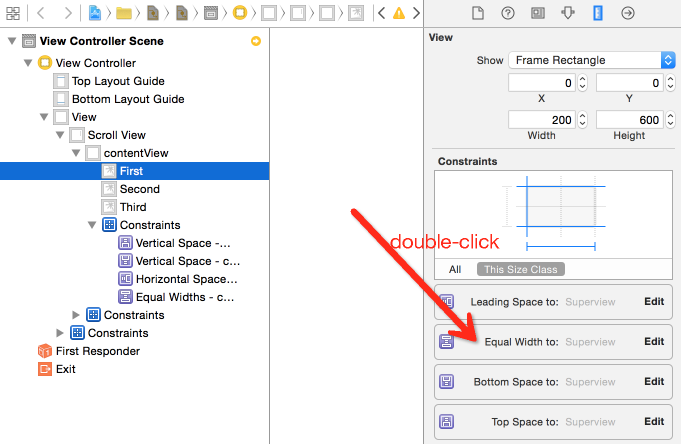 Let's open Size inspector of First (Image View) and double-click Equal Width constraint. So what we set means the first Image View's width equals one third of contentView's width. Then do the same for the next two Image Views. 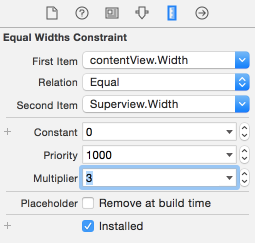 One last step, set contentView's width to be three times of its superview (Scroll View). You can only one image now, that is the reason why we put the step as the last one. Now run the program, the effect is just what you want.